by Sylvia Dianne Beverly "Ladi Di"
It's that time of year for excitement, reflection and action, so "Collective Voices" Poetry Ensemble is taking time out to plan Poetry Extravaganza-2016. "Collective Voices" consist of founding members Sylvia Dianne Beverly, (Ladi Di), J. Joy Alford, (Sistah Joy) and more recently Andre Taylor, (Brenardo). This will be the 20th year celebrating the life and legacy of Rev. Dr. Martin Luther King Jr. at the Martin Luther King Jr. Memorial Library in downtown Washington, D.C., in partnership with CAAPA. This year’s theme is "Bridging the Gap", and will be the main focus throughout the celebration. We celebrate with Music, Dance, Song Prayer and Poetry. The celebration will be hosted by WPFW's Radio Personality Josephine Reed and will start with drumming and dancing by The Malcolm X Drummers and Dancers, Ian Sydney Match, James Curly Robinson and Lorenzo Sands, along with others. Our national anthem will be sung by soprano Pamela Simonson. We must recognize the importance of filling the GAP between positive life sustaining entities such as our youth and elders, our people and our nation and various medias of Art and our artist. Reflecting on Dr. King and his dedication, especially during times of challenge and controversy, we hope to attract the attention of our audience in order to form a better nation/world in which to live. This is a family friendly event, free of charge and open to all. We hope everyone will bring another, especially our youth and elders. Along with "Collective Voices", there will be three featured adult poets, (CeLillianne Green, Charles Cary and Patrick Washington) and three youth presenters, Nathaniel Matthews (soloist), Antonio Hammett, (soloist) and Nehemiah Sellers, (orator). Another highlight will be a presentation from Poet of Distinction Grace Caviler. 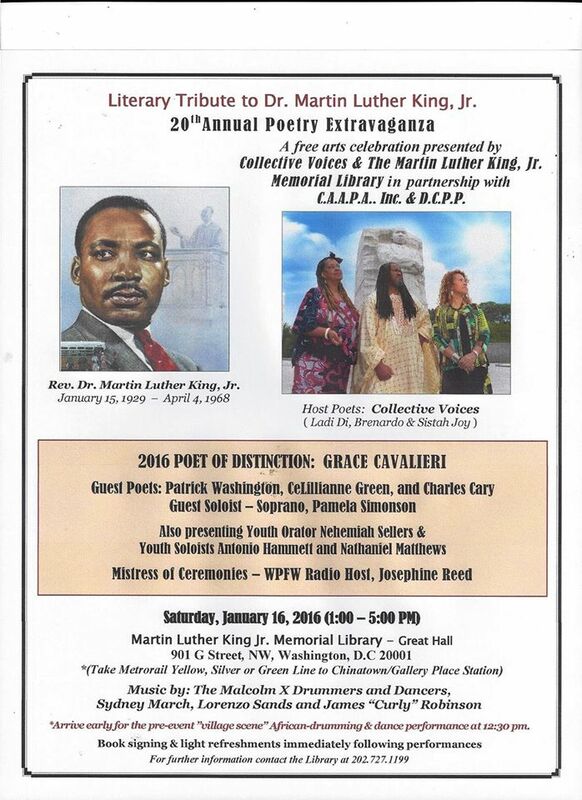 In addition there will be a special recitation of Dr King's speech by poet/orator Avery Tynes. Oh what a gloriously planned day of enlightenment, encouragement and entertainment this will be, just the kick-start we need to help fulfill our resolutions for the New Year. It's a Family Affair so, we hope to see our youth and elders there. Plan to attend. For all poets and writers, keep writing, keep sharing, keep using your God-given talents. For all who have thought about writing, go ahead, give it a try, you might like it. at very least, you will always have something meaningful to do. Poetry is my Passion! That glorious day is upon us. Three more days, I am ready and inspired to receive and enjoy all God has planned for us. Thank you to Dayo who never fails to show support and care. We are "Bridging the GAP". I heard Ladi Di talk about this program today at the Splendid Wake planning meeting and I'm Xcited. There will be singing, dancing, and poetry performance!! Looking forward and many thanks to Ladi Di for writing this blogpost and for bringing it to my attention! Also, it would be interesting to read about the history of this event. So many poets, musicians, and dancers must have graced the stage over the years. Yes, this would be a wonderful topic for a blog entry...hint...hint!